How To Remove Moles: Permanent Features & Mole Removal Cost? While I can’t say I’m personally a wearer of moles, I know a few people who are. For the most part, they’ve generally grown to accept these features as something that’s part of them. However, that’s not to say they’re pleased with them. Most of my friends would love the opportunity to remove them and I’ve approached them with the suggestion I’m about to outline. If you’re in the same boat as my friends, then I’d like for you to know that there is a way to remove moles if you’re dissatisfied with them. So, how can moles be removed? Let’s find out. A mole is scientifically known as a melanocytic nevus. It is a dark, benign tumor that grows underneath the skin. The majority of moles will appear within the the first twenty years of a person’s life and at least one in every 100 babies are born with moles. Moles are sometimes confused for melanoma, but the overall majority of these skin lesions won’t cause any health problems for the person. Most of the unpleasantness associated with having moles are cosmetic reasons, if the person wishes to remove them and find them bothersome. There are three primary reasons for the formation of moles: genetics, exposure to sunlight, and hormonal imbalances. The majority of moles are caused by having a genetic predisposition to moles. Sometimes, a person may have a genetic variation that causes an overwhelming number of moles to grow. “Atypical mole syndrome” is a hereditary gene that is passed between birth parents and their offspring. Sometimes, this can cause individuals to grow up to and occasionally over 100 moles. This quantity also places the person at risk for the development of melanoma, a type of skin cancer. However, it is important to note that it is extremely rare for a benign mole to suddenly “become” cancerous. A melanoma will almost always grow as a new, independent growth. The reason it’s associated with mole growth is because of their similar appearances. Differentiation requires the opinion of an expert dermatologist, who will use specialty tools to see whether or not a mole is cancerous. Experts also believe that exposure to UV radiation plays a role in the formation of acquired moles later in life. Exposure to excessive sunlight is well-known to cause premature aging, skin damage, and is a favorable scenario for the growth of a melanoma. Likewise, hormonal imbalances during pregnancy and diabetic swings have also been shown to contribute to mole formation. When exploring removal options, most are only familiar with the three forms of surgical procedures: traditional “knife” surgery, laser surgery, and electrocautery. If individuals only want to remove one or two moles, they’re often candidates for traditional surgery. In this setting, moles are “shaved” after the surgeon has placed a local anesthetic on the mole being treated. This prevents the patient from feeling any pain or discomfort during the procedure. Laser surgery is also becoming a popular alternative to the shaving method as the unsightly scars associated with more traditional forms of surgery are greatly reduced and the procedure achieves a better cosmetic effect as a result. Electrocauterization is rarely used in a mole removal, but can be utilized when there is a risk for bleeding in the patient or the patient has iron deficiencies that would make any bleeding difficult to manage. 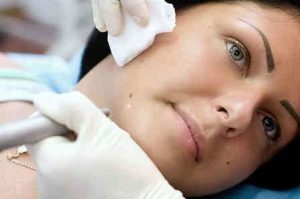 In this method, a mole is effectively “burned” by a metal probe and electric current to be removed from the skin, which hardens the blood vessels in the process. It is not as sightly as laser surgery, but achieves similar results. Traditional surgery carries risks and complications. Above all, many surgical procedures simply aren’t sightly as they leave behind skin irritations, blemishes, and scars. This completely defeats the purpose of cosmetic surgery in the first place! Fortunately, there are removal methods that don’t require the individual to leave his or her home. They’re also manufactured with the cosmetic result in mind. Now, it’s time to reveal the best in-home solution for mole removal. No, it’s not a blade-based kit that seems to dominate much of the removal kit scene. It’s actually a cream that penetrates the mole to visibly reduce its appearance and gradually causes the mole to fall off of the skin. Believe it or not the actual mole removal doesn’t cost as much as you think. We here at removemolesandtags.com have searched for the best products and advice on how to keep the cost to a minimum.